Prepare molds. (I used plastic cups.) Spray them lightly with cooking spray. In a small saucepan, combine sugar, water and grapefruit juice. Sprinkle gelatin over top and allow to rest for 5 minutes until gelatin is softened and the liquid’s surface appears slightly wrinkled. Turn heat on to medium. Stir mixture until sugar dissolves and gelatin is smooth. Do not boil. Remove from heat. Stir in tequila. Distribute the liquid evenly among the molds. Refrigerate 3 to 4 hours before serving. Garnish with a salt rim and a wedge of grapefruit gummy candy. 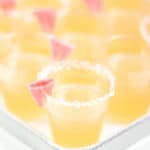 The taste of these jello shots is very bitter when enjoyed as soon as they are set (3-4 hours). I find they taste much better — sweeter but still flavorful — once they have sat for 12-24 hours. I recommend making them in advance!